I arrived in Manila last night at around 11:30 PM after a much delayed flight. It didn’t really bother me that much because I was not in any need of haste. Oh, by the way, the controversial Senator Jamby Madrigal was in 1F, that’s 4 seats in front of me on flight PR 816. Which brought me to ask (internally), had she been checking out Davao’s attractions lately? A stroll at the People’s Park maybe? I noticed she had a slight tan. So was it Pearl Farm? Malipano? Buenavista Island of the Davao Ayalas (vis-a-vis the Makati Ayalas)? Uhmm maybe not, it looked pretty much like her natural skin tone. Then, was she taking a little break from Senatorial hubbub or was she taking time off from the row on her aunt’s estate (allegedly worth more than the ZTE deal)? I doubt it. It was a pretty smooth flight though, but a little rough on the landing. So, okay, now to my story. My mom know quite a number of people at PAL, for regularly “flying Philippine Airlines,” and being rather friendly to the staff. Sometimes I wonder why attendants at the Mabuhay Lounge (in Manila) would serve her food and stuff. I mean, isn’t the Mabuhay Lounge a self-service area? Must be the privilege of being a Mabuhay Premier Elite member. So, it was not the least surprising that when I went to the Philippine Airlines ticketing office at the Davao International Airport to pay for my unplanned flight, one of the ladies handed a shiny, crisp copy of Mabuhay Magazine. Apparently, my mom had told them about my story having made it to the Mag. It was rather flattering, although a little awkward, but at least I wouldn’t have to steal a copy from the Business class seats in the plane! So, that over, I went to the parking area supposedly to take off and finish packing. But then something familiar figured in my periphery, something so familiar but which I haven’t gotten the chance to see up close. So I grabbed my Nokia and treaded closer to a silhouette of a structure that even the dumbest brain surgeon would recognize as, none other than, a Durian. A pretty huge one to be exact. So huge in fact that six people can fit in a fifth of it. I went over and clicked away. But I was immensely frustrated with the results because the glare from the early afternoon sun was getting to my phone’s camera lens thereby obliterating the “face” of the sculpture. All i was getting was a dark silhouette, so I relented on the fifth take. A while ago, thinking I should post the pic on this Blog as planned, I was a great deal worried about how my readers would take it. I mean, I feared reactions like, “thanks for posting that spiny shadow,” and similar forms of mockery. So, with a gleam of hope and lots of desperation, I opened Photoshop and tested my crude skills at editing pictures. So I worked on the picture, duplicating layers, working on levels, as well as adjusting saturation and using the eraser tool (thanks to the help files and online forums). It took me a good three hours on my laptop. The final product? To my unskilled eye, it looked good enough because it lent a better view of the sculpture’s details: Six people, men and women, presumably native, arranged in two vertical columns, like durian pulp when one of the seed chambers of a real fruit is opened. Curiously, and I noticed this when I was shooting it, a tiny plant has taken root in the exact center of sculpture’s face. Click on the pic to see the larger image. 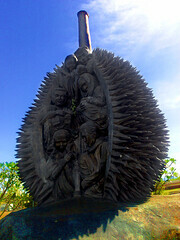 The Durian sculpture at the Davao International Aiport was created by Davao’s very own Kublai Millan. Kublai also did the awesome sculptures at downtown Davao’s brand new People’s Park. I also took few other pictures: the roof details of the Davao International Airport as well as the Welcome sign on the sloping lawn on the way out of the Airport compound. Go check them out and tell me what you think. Hope you like ’em. Wow! Davao=Durian .. so dapat lang talaga .. hehe. Yep yep, don’t miss it when you’re in Davao @Chiq Montes… have your pic taken there. hehehe. Hi Kitty! Guess what, I haven’t explored all the wonderful places in Davao! It simply has a lot to offer. I will do more features on the new places I’ll set my foot on, as well as the places I’ve been to but still finding time to post. WSow thats pretty big but delicious I’m sure!